... the vale narrows; the mountains become steep and rugged, with streams of boulders down their slopes; and. presently, we are under "the dark brow of the mighty Helvellyn." Helvellyn is the monarch of the lake mountains: Sca Fell is a hundred feet higher; Skiddaw, Sca Fell, and Helvellyn are all over 3000 feet; but neither of the others is such a big, swelling, giant of a mountain as Helvellyn. We are too close to the Monarch to see his crown: our road lies under his vast shoulder; but we cannot pass him by. We must leave our box-seat [of out coach], and breast the hill, prepared for two or three hours' hard climbing. you may make your way up by one of these edges; but beware of a false step on either side of the narrow pathway; one such step, and you are plunged down a precipice of a hundred feet. "A barking sound the shepherd hears." On the summit of the mountain there is an awful stillness; not an insect hums in the air; we no longer hear the roar of the mountain torrents; not a blade of grass is to be seen; cushions, or tufts of moss, parched and brown, appear between the huge blocks and stones that lie in heaps on all sides; the snow lies here for half the year. now and then. Print, colour halftone, Thirlmere and Helvellyn, St John's Castlerigg and Wythburn, Cumberland, from a watercolour painting by Alfred Heaton Cooper, published by Adam and Charles Black, London, 2nd edn 1908. Opposite p.168 of The English Lakes, painted by Alfred Heaton Cooper, described by William T Palmer. Print, uncoloured lithograph, Helvellyn from Thirlmere, St John's Castlerigg and Wythburn, Cumberland, by Joseph Pennell, published by Macmillan and Co, London, 1901. On page 244 of Highways and Byways in the Lake District, by A G Bradley. STRIDING EDGE AND RED TARN, HELVELLYN. Photograph, black and white, Helvellyn and Thirlmere, St John's Castlerigg and Wythburn, Cumberland, by Herbert Bell, photographer, Ambleside, Westmorland, 1890s? Photograph, sepia, Striding Edge, Helvellyn, Patterdale, Westmorland, by Herbert Bell, photographer, Ambleside, Westmorland, 1890s. Photograph, black and white, Helvellyn from Thirlmere, St John's Castlerigg and Wythburn, Cumberland, by Herbert Bell, photographer, Ambleside, Westmorland, 1890s. Photograph, black and white, Helvellyn and Striding Edge, Patterdale, Westmorland, by Herbert Bell, photographer, Ambleside, Westmorland, 1890s. Photograph, black and white, sunset over Helvellyn, St John's Castlerigg and Wythburn, Cumberland, by Herbert Bell, photographer, Ambleside, Westmorland, 1890s. Photograph, sepia, Wath Bridge and Helvellyn, Thirlmere, St John's Castlerigg and Wythburn, Cumberland, by Herbert Bell, photographer, Ambleside, Westmorland, 1890s. Print, colour lithograph, Fresh Snow on Helvellyn, view near Oxenfell, Cumberland, from a painting by Elijah Walton, published by W M Thompson, 20 Cockspur Street, Pall Mall, and Burlington Gallery, Piccadilly, London, 1876. Plate 9 in English Lake Scenery, with a description by T G Bonney. Print, colour lithograph, Helvellyn, from above the Langdales, Westmorland/Cumberland, from a painting by Elijah Walton, published by W M Thompson, 20 Cockspur Street, Pall Mall, and Burlington Gallery, Piccadilly, London, 1876. Plate 20 in English Lake Scenery, with a description by T G Bonney. Print, engraving, outline view, Mountains seen from the West Side of Thirlmere, drawn by L Aspland, engraved by W Banks, Edinburgh, published by John Garnett, Windermere, Westmorland, and by Whittaker and Co, London, 1855. MOUNTAINS SEEN FROM THE WEST SIDE OF THIRLMERE. L Aspland Delt. / W Banks Sc Edinr. 1 Raven Crag, 2 Castlerigg, 3 Blancathra vulgariter Saddleback, 4 Great How, 5 Green Crag, 6, Great Dod, 7 Part of Helvellyn. ... the tradition of the tramp of armies over Helvellyn, on the eve of the battle of Marston Moor. And now the tourist may proceed, - looking for ghosts, if he pleases, on Souter Fell. dividing line between Cumberland and Westmorland. Northwards, the view is bounded by the Scotch mountains, with the Solway at their feet. Nearer stands Saddleback, with Skiddaw a little to the left. Kepel Cove Tarn lies below, with Catchedecam on the right. Eastwards, Red Tarn lies immediately below, between its two solemn precipices. Ullswater shines beyond, its nearer bank fringed by Gowbarrow Park; and Crossfell closes in the view afar. The Troutbeck mountains here peep over Striding Edge. Kirkstone and Fairfield rise to the south; and over the latter, there is a peep at Windermere, and sometimes, in clear weather, a glimpse of Lancaster Castle. Esthwaite Water and the sea in Morecambe Bay are seen at the same time. Blackcombe is caught sight of through Wrynose Gap; and the Coniston range and Langdale Pikes lead the eye round to the superior summits at the head of Wastdale and Buttermere. Even Honister Crag is seen, in a hollow, a little to the left of Cat Bells. Derwentwater is not seen: nor, from the higher Man, either Thirlmere or Bassenthwaite; though the two last are visible from the lower Man. Six lakes are seen, besides many tarns:- Ullswater, Windermere, Esthwaite Water, Coniston, Bassenthwaite and Thirlmere. Angle Tarn is particularly conspicuous, while its neighbour, Hays Water, is hidden in its hollow under High Street. The streams it sends down to Brothers' Water are however, very conspicuous when the sun is upon them. A TABLE OF THE HEIGHTS OF MOUNTAINS IN THE COUNTIES OF CUMBERLAND, WESTMORLAND, AND LANCASHIRE. No. : Names of Mountains. : Counties. : Height in Feet above the Sea Level. ... THE Lake district ... consists of large masses or clusters of mountains, generally terminating in one aspiring and pre-eminent point, with the intermediate valleys occupied either by lakes and their subsidiary tarns, or by winding rivers. serving as large buttresses only. In the presentation of endlessly-diversified forms, these Mountains yield to none, however individually inferior they may be, owing to their being seldom seen in a detached point of view; although, on the other hand, they have thus the advantage of forming combinations at once grand and sublime, towering above each other, or rising in ridges, like the mighty billows of the ocean. Windermere, Coniston, and Esthwaite, the Lancaster Sands, and Yorkshire mountains, fill the horizon; in the west, the Langdale Pikes and Wry Nose rise beyond Wythburn Head; the Scafell Pikes, with Great End and Lingmell, the Borrowdale mountains, Glaramara, and Great Gable, stand in bold relief against the sun's declining beams. The Derwent mountains complete the circle, the surface of Bassenthwaite glowing like burnished gold, and the lordly Criffel lifts his azure head over Solway's foaming tide. 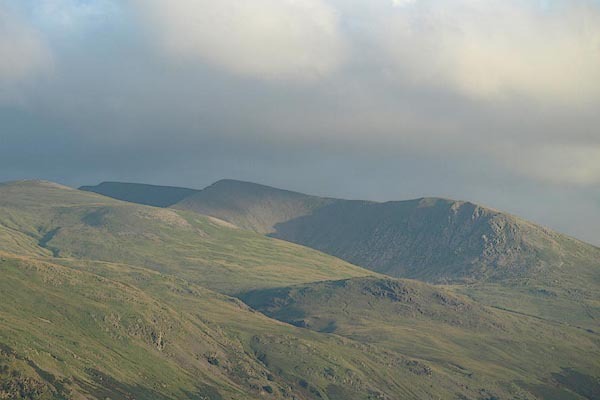 Helvellyn is three thousand and fifty-five feet above the level of the sea. The Mountains of Ulswater: / as seen from Pooley Bridge. The Mountains of Patterdale: / as seen from the Slate Quarry on Place Fell. Engraving, outline view of mountains, Grasmere from Red Bank Head, drawn by T Binns, engraved by O Jewitt, opposite p.4 of A Descriptive Guide of the English Lakes, by Jonathan Otley, 8th edition, 1849. Engraving, outline view of mountains, Ullswater from Pooley Bridge, drawn by T Binns, engraved by O Jewitt, opposite p.12 of A Descriptive Guide of the English Lakes, by Jonathan Otley, 8th edition, 1849. Engraving, outline view of mountains, Mountains of Patterdale from the Slate Quarry on Place Fell, drawn by T Binns, engraved by O Jewitt, opposite p.14 of A Descriptive Guide of the English Lakes, by Jonathan Otley, 8th edition, 1849. Latitude 54° 31′ 43″ N. Longitude 3° 0′ 24″ W. Height 3070 feet. Set of prints, Picturesque Tour of the English Lakes, illustrated with hand coloured aquatints by Theodore Henry Fielding and John Walton, published by R Ackermann, 101 Strand, London, 1821. Print, coloured aquatint, Wythburn Water and Helvellyn, Cumberland, drawn by Theodore H A Fielding, published by R Ackermann, 101 Strand, London, 1821. Tipped in opposite p.125 in A Picturesque Tour of the English Lakes. ... the highest of our northern Alps, Helvellyn. Cambden speaking of Helvellyn calls it Lauvellin, and says that the country people had a proverb concerning it. bearing calculated from grid references = 0 degrees. Map series, lakes and roads to the Lakes, by James Clarke, engraved by S J Neele, 352 Strand, London, included in A Survey of the Lakes of Cumberland, Westmorland and Lancashire, published by James Clarke, Penrith, and in London etc, from 1787 to 1793. Shown by a circle of hachuring across the county boundary. [tre]mendously great. Helvellyn and Cachidecam are the chief; and, according to Wythburn shepherds, much higher than Skiddaw. It is, however, certain that these mountains retain snow many weeks after Skiddaw; but that may be owing to the steepness of Skiddaw's northern side, and shivery surface, that attracts more forcibly the solar rays, than the verdant front of Helvellyn, and so sooner looses its winter covering. A thousand huge rocks hang on Helvellyn's brow, which have been once in motion, and are now seemingly prepared to start anew. Many have already reached the lake, and are at rest. The road sweeps through them, along the naked margin of the lake. ... no mountain in England touches the zone of barrenness that intervenes between this region and the limits of vegetation. Sheep pasture the summits of Snowden, Helvellyn, and Skiddaw, and barrenness only prevails where rock and precipice are invincible obstacles to vegetation. ... [from Castlerigg] ... the summits of Cachidecam (called by Camden Casticand) and Helvellyn, said to be as high as Skiddaw, and to rise from a much higher base. Oct. 8. I left Keswick, and took the Ambleside road, ... Came to the foot of Helvellyn, along which runs an excellent road, looking down from a little height on Leathes-water, ... all is rock and loose stones up to the very brow, which lies so near your way that not above half the height of Helvellyn can be seen. SOUL of the world, refulgent sun! / Oh, take not from my ravish'd sight / Those golden beams of living light, / Nor, ere thy daily course be run, / Precipitate the night. / Lo! where ruffian clouds arise, / Usurp the abdicated skies, / And seize the aethereal throne: / Sullen sad the scene appears, / Huge Helvellyn streams with tears! / Hark! 'tis giant Skiddaw's groan, / I hear terrific Lowdore roar; / The sabbath of thy reign is o'er, / The anarchy's begun; / Father of light! return; break forth, refulgent sun! Are th' highest Hills in all England. Marked with a circle on the side of the hillock. In miles 20 to 24, Cumberland. Range of mountain on the right of the road for 4 miles. Hillock with a gentleman sitting on top, with a staff; out of place!. Print, etching? Helvellyn, Westmorland, by Harry Goodwin, published by Swan Sonnenschein and Co, Paternoster Square, London, 1890. Tipped in opposite p.142 of Through the Wordsworth Country, by William Knight. Book, Our Beautiful Homeland, volume including The English Lakes, by George Benson, A G Bradley, and R Murray Gilchrist, illustrated by Ernest W Haslehurst, published by The Gresham Publishing Co, 66 Chandos Street, London, 1900s? Print, colour halftone, Thirlmere and Helvellyn, Cumberland, by Ernest W Haslehurst, published by The Gresham Publishing Co, 66 Chandos Street, London, 1900s? Tipped in opposite p.20 of The English Lakes section of a volume of Our Beautiful Homeland. Print, engraving, Helvellyn, from Bull Crags, Cumberland, published by John Johnstone, Paternoster Row, London, et al, 1847. On p.153 of Sylvan's Pictorial Guide to the English Lakes. Guide book, The Lakes of England, by George Tattersall, published by Sherwood and Co, Paternoster Row, London, about 1836. Print, hand coloured, Thirlmere, from the North, Cumberland, drawn by George Tattersall, 1836, engraved by W F Topham, published by T J Allman, 463 Oxford Street, London, 1869. Included in The Lakes of England, by W F Topham. THIRLMERE, / from the North. Helvellyn. / Steel Fell. / Raven Crag. / Borrowdale Fells. Each print is captioned with mountain names and acts as an outline view. Print, engraving, View from Helvellyn, looking North, Cumberland and Westmorland, drawn by George Tattersall, engraved by W F Topham, published by Sherwood and Co, Paternoster Row, London, about 1836. Tipped in opposite p.68 of The Lakes of England, by George Tattersall. VIEW FROM HELVELLYN. / looking North. ... VIEW FROM THE SUMMIT OF HELVELLYN. I. LOOKING NORTH. / 1. Scotch Mountains. / 2. Solway Frith. / 3. Skiddaw, Cumberland. / 4. Thelcot Vale, Cumberland. / 5. Saddleback, Cumberland. / 6. Scilly Bank, Cumberland. / 7. Matterdale, Westmoreland. / 8. Dodd Fell, Westmoreland. / 9. Grisedale Fell, Cumberland. / 10. Greenside, Cumberland. / 11. Catsedecam, Cumberland. / 12. Helvellyn Top, Westmoreland. / 13. Keppel Cove Tarn, Westmoreland. / 14. Swirrel Edge, Westmoreland. Print, engraving, View from Helvellyn, looking East, Cumberland and Westmorland, drawn by George Tattersall, engraved by W F Topham, published by Sherwood and Co, Paternoster Row, London, about 1836. VIEW FROM HELVELLYN. / looking East. ... VIEW FROM THE SUMMIT OF HELVELLYN. II. LOOKING EAST. / 1. Matterdale, Westmoreland. / 2. Martindale, Westmoreland. / 3. Dodd Fell, Cumberland. / 4. High Row, Cumberland. / 5. Stybarrow Crag, Westmorel. / 6. Ullswater. / 7. Swarth Fell, Westmoreland. / 8. Kidsay Pike, Cumberland. / 9. Harter Fell, Westmoreland. / 10. Cross Fell, Westmoreland. / 11. Beck Fell, Westmoreland. / 12. Thrang Crag, Westmoreland. / 13. Place Fell, Westmoreland. / 14. Glenridding, Westmoreland. / 15. Gowbarrow Parks, Cumberland. / 16. Black Coomb, Cumberland. / 17. Swirrel Edge, Westmorel. / 18. Red Tarn, Westmoreland. / 19. Striding Edge, Westmorel. Print, engraving, View from Helvellyn, looking South, Westmorland and Lancashire, drawn by George Tattersall, engraved by W F Topham, published by Sherwood and Co, Paternoster Row, London, about 1836. Tipped in opposite p.69 of The Lakes of England, by George Tattersall. VIEW FROM HELVELLYN. / looking South. ... VIEW FROM THE SUMMIT OF HELVELLYN. III. LOOKING SOUTH. / 1. High Street, Westmoreland. / 2. Scandale, Westmoreland. / 3. Hill Bell, Westmoreland. / 4. Long Sleddale, Westmorel. / 5. Shap Fells, Westmoreland. / 6. Arnside Fells, Lancashire. / 7. Kirkstone, Westmoreland. / 8. Fairfield, Westmoreland. / 9. Dolly Waggon Pike, Westmoreland. / 10. Loughrigg Fell, Westmoreland. / 11. Cartmell Fell, Lancashire. / 12. Morecambe Bay. / 13. Windermere Lake, Westmoreland and Lancashire. / 14. Esthwaite Water, Lancashire. / 15. Nibthwaite Fells, Lancash. / 16. High Birch, Lancashire. / 17. Foulsha, Westmoreland. / 18. Grange Fells, Lancashire. / 19. Coniston Old Man, Lancash. / 20. Coniston Lake, Lancashire. / 21. Hawkshead Moor, Lancash. / 22. Graythorte, Lancashire. / 23. Wernfell, Lancashire. / 24. Helvellyn, Cumberland. / 25. Striding Egde, Westmoreland. Print, engraving, View from Helvellyn, looking West, Westmorland, Cumberland and Lancashire, drawn by George Tattersall, engraved by W F Topham, published by Sherwood and Co, Paternoster Row, London, about 1836. VIEW FROM HELVELLYN. / looking West. ... VIEW FROM THE SUMMIT OF HELVELLYN. IV. LOOKING WEST. / 1. Coniston Fells, Lancashire. / 2. Black Combe, Cumberland. / 3. Lingmire, Westmoreland. / 4. Blakerigg, Westmoreland. / 5. Deer Bells, Westmoreland. / 6. Langdale PIkes, Westmorel. / 7. Bow Fell, Westmoreland and Cumberland. / 8. Wilbeck, Cumberland. / 9. Scawfell and Scawfell Pike, Cumberland. / 10. Muncaster Fell, Cumberland. / 11. Great End, Cumberland. / 12. Great Gavel, Cumberland. / 13. Honiston Crag, Cumberland. / 14. Cat Bells, Cumberland. / 15. Grange Fell, Cumberland. / 16. Red Pike, Cumberland. / 17. Robinson, Cumberland. / 18. Grasmoor, Cumberland. / 19. Causey Pike, Cumberland. / 20. Vale of Newlands, Cumberl. / 21. Whiteless Pike, Cumberland. / 22. Pillar, Cumberland. Print, colour, Striding Edge, Helvellyn, by Alfred Heaton Cooper, published by Adam and Charles Black, 4-6 Soho Square, London, 2nd edn 1928. Tipped in opposite p.172 in Wild Lakeland by MacKenzie MacBride. Guide book, LMS Route Book no.3, The Track of the Royal Scot, part 1 London Euston to Carlisle, by Edmund Vale, published by the London Midland and Scottish Railway, LMS, 1920s. Hills from Penrith Station, published in the LMS Route Book No.3, The Track of the Royal Scot, by the London Midland and Scottish Railway, LMS, 1920s. Guide book, A Practical Guide to the English Lake District, by Henry Irwin Jenkinson, published by Edward Stanford, 55 Charing Cross, London, 4th edition 1875. Print, lithograph, outline view, Panoramic Sketches from Helvellyn, Westmorland, by Edwin A Pettitt, London, published by Edward Stanford, 55 Charing Cross, London, 1875. Print, lithograph, outline view, Panoramic Sketches from Skiddaw, Cumberland, by Edwin A Pettitt, London, published by Edward Stanford, 55 Charing Cross, London, 1875. Print, lithograph, outline view, Panoramic Sketches from Scawfell Pike, Cumberland, by Edwin A Pettitt, London, published by Edward Stanford, 55 Charing Cross, London, 1875. Guide book, The English Lakes, Peaks and Passes, from Kendal to Keswick, by George King Matthew, published by J Richardson, Highgate, Kendal, Westmorland, 1866. Print, engraving, outline view, Helvellyn from above Harrop Tarn, Poney Road from Wythburn to Whatendlath and Borrowdale, Cumberland, published by J Richardson, Highgate, Kendal, Westmorland, 1866. Tipped in before p.1 of The English Lakes, Peaks and Passes, from Kendal to Keswick, by George King Matthew. HELVELLYN FROM ABOVE HARROP TARN, PONEY ROAD FROM WYTHBURN TO WHATENDLATH AND BORROWDALE. Guide book, Black's Guide to the English Lakes, published by Adam and Charles Black, North Bridge, Edinburgh, Lothian, Scotland, or Soho Square, London, 1856 to 1900s onwards. Print, lithograph, Outline Views, Ullswater - Mountains as seen a little on the Matterdale Road near Lyulph's Tower on Ullswater, and Mountains as seen at the Slate Quarry at Blowick on Ullswater, by J Flintoft, Keswick, Cumberland, engraved by R Mason, Edinburgh, Lothian, about 1900. Print, lithograph, Outline Views, Grasmere and Coniston - Mountains as seen from Redbank, Grasmere, and Mountains as seen a little beyond Tent Lodge on the Road from Coniston to Ulverstone, by J Flintoft, Keswick, Cumberland, engraved by R Mason, Edinburgh, Lothian, about 1900. Print, uncoloured engraving, outline view, Mountains seen from the West Side of Thirlmere, drawn by L Aspland, engraved by W Banks, Edinburgh, published by John Garnett, Windermere, Westmorland, and by Whittaker and Co, London, 1855. Used opposite p.69 in A Complete Guide to the English Lakes, by Harriet Martineau. The view is captioned, numbers referring to mountains in the image - 1 Raven Crag, 2 Castlerigg, 3 Blancathra vulgariter Saddleback, 4 Great How, 5 Green Crag, 6, Great Dod, 7 Part of Helvellyn. Opposite p.69 in A Complete Guide to the English Lakes, by Harriet Martineau. The view is captioned, numbers refering to mountains in the image - 1 Raven Crag, 2 Castlerigg, 3 Blancathra vulgariter Saddleback, 4 Great How, 5 Green Crag, 6, Great Dod, 7 Part of Helvellyn. Print, uncoloured engraving, Helvellyn, from the North West, Cumberland, drawn by Thomas Allom, engraved by R Sands, published by Fisher, Son and Co, London, 1835.
vol.3 pl.3 in the set of prints, Westmorland, Cumberland, Durham and Northumberland Illustrated. T. Allom. / R. Sands. / HELLVELYN, FROM THE NORTH WEST, CUMBERLAND. Print, engraving, View from Skiddaw, looking South, Cumberland, Westmorland and Lancashire, drawn by George Tattersall, engraved by W F Topham, published by Sherwood and Co, Paternoster Row, London, about 1836. The print is captioned with mountain names and acts as an outline view. Tipped in opposite p.91 of The Lakes of England, by George Tattersall. Print, engraving, Thirlmere from Raysgap, Cumberland, drawn by George Tattersall, engraved by W F Topham, published by Sherwood and Co, Paternoster Row, London, about 1836. Tipped in opposite p.54 of The Lakes of England, by George Tattersall. Pt. of Steel Fell. / Borrowdale Fells. / Raven Crag. / Skiddaw. / Helvellyn. Print, lithograph, Panoramic View from Summit of Helvellyn, engraved by John Bartholomew and Co, Edinburgh, published by Ward, Lock and Co, Warwick House, Salisbury Square, London, 1930s. Guide book, Ascents and Passes in the Lake District of England, by Herman Prior, published by John Garnett, Windermere, Westmorland, and by Simpkin, Marshall and Co, London, 1865. Print, uncoloured engraving, Helvellyn from Harrop Tarn, St John's Castlerigg and Wythburn, Cumberland, published by John Garnett, Windermere, Westmorland, and by Simpkin, Marshall and Co, London, 1865. Included on page 62 of the guide book, Ascents and Passes in the Lake District of England, by Herman Prior. Photograph, halftone print, Red Tarn, Helvellyn, St John's Castlerigg and Wythburn, Cumbria, by W G Foster, published by Edmund Bogg, 3 Woodhouse Lane, and James Miles, Guildford Street, Leeds, Yorkshire, 1898. Included on p.172 of Lakeland and Ribblesdale, by Edmund Bogg. Guide book, Black's Picturesque Guide to the English Lakes, published by Adam and Charles Blck, North Bridge, Edinburgh, Lothian, Scotland, 1841 to 1888. Print, engraving, outline view, Mountains as seen from Red Bank, Grasmere, and Mountains as seen a little beyond Tent-Lodge on the Road from Coniston to Ulverston, by J Flintoft, Keswick, Cumberland, engraved by R Mason, Edinburgh, Lothian, about 1846. Print, engraving, outline view, Mountains as seen a little on the Matterdale Road near Lyulph's Tower on Ulleswater, and Mountains as seen at the Slate Quarry at Blowick on Ulleswater, by J Flintoft, Keswick, Cumberland, engraved by R Mason, Edinburgh, Lothian, about 1846.
hearsay You might see a Brocken Spectre from the top of Helvellyn, when a low sun casts your shadow on mist lying below. The shadow is exactly your size, but the effect of perspective makes the shadow, at a distance, appear huge. ... to bring into exercise a set of muscles which would otherwise have grown stiff. Not one step more! There is nothing but mist to tread on! Saving the party on the cliff above Red Tarn.